It’s Moonrise Kingdom meets Bottle Rocket as animation with Wes Anderson demonstrating exactly how talented a filmmaker he really is. This is a wonderful movie. It is such a pure Wes Anderson film that it not only captures his usual sense of humor, and all of his stylistic touches, but also the same overall sub genre of storytelling that most of his films fit into. That sub genre is about a guy who thinks he is better than the world and doesn’t care who he hurts, and also it’s about kids who think and act like they are adults. In this movie, it’s not kids but animals, and it’s just as much fun. The storyline here is kind of simple, involving a series of heists on farms, and then the farmers who come after the animals for revenge. But the movie isn’t about the story as much as it is about the humor, excitement, and fun. 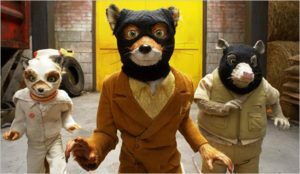 Fantastic Mr. Fox is a pretty great movie. It’s A Wes Anderson film, (his first animated picture,) and the amazing thing is that despite the animation, the movie has all of his usual touches, and feels very much like every one of his other films. It has everything that makes up a Wes Anderson movie from the vivid colors to the music to the black humor to the idea of taking grown up things and looking at them from a mature kid’s point of view (where kids act like adults.) Only this time, it’s not kids. It’s animals. And the fact that this theme of Anderson movies transfers so smoothly from live action to animation, and from kids to animals, is pretty incredible. 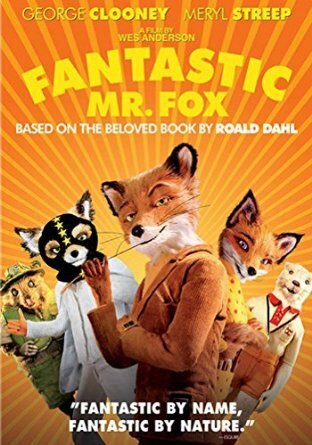 In the opening sequence, Mr. Fox, (voiced perfectly by George Clooney,) is crafting a scheme with his wife about how to raid a farmer’s chicken coop. His wife (voiced by Meryl Streep,) isn’t thrilled about the idea, but she goes along with it. We see their approach, jumping on things, hanging from wires, sliding under obstacles, and hiding behind objects. It’s very well-choreographed in a Jackie Chan / Chaplin kind of way, and it’s set to some fun, fast paced music. This is a fun first scene, and it really gets the movie started on the right foot. Theres also humor involved in the scene, with Fox thinking he’s smarter than the farmers who set a trap and pulling a rope that actually unleashes the trap right on top of him and his wife. Fox pulls it because he’s certain that the trap is going to fall down in a certain spot and wants to see it for himself. Instead, the traps lands right on top of him. And the funny thing is, there was really no reason for him to pull it at all. It’s just when of many humorous examples of this guy’s arrogance early on. There are other examples that even come before this one. When deciding on which way to go in order to get to the farm, Fox asks his wife to make a decision. Does she want the short cut or the scenic route. She tells him the short cut, only for Fox to respond about why the scenic route is better. This actually happens twice. And just like the cage situation, it’s a matter of Fox doing whatever he wants without thinking of others. He’s got a plan, or thinks he does, and he certainly thinks he’s smarter than everyone else. The funny thing is, he’s not. His wife is clearly the more intelligent one, and she gets frustrated with his poor decision making. And with all this about Fox doing what he wants, and the obstacle course like situation that they run, to get into the chicken coop, there’s still room for some pretty great humor. At one point Fox compliments his wife, telling her that she’s glowing. And then he basically takes it back, saying that “maybe it’s just the light.” This shows that he is more scientific that sentimental, in the same way that other characters in Wes Anderson movies have also never thought twice about hurting someone else’s feelings, in order to be honest about the situation. Just think of Royal Tenenbaum in that movie, (played by Gene Hackman,) explaining to everyone he introduces his daughter to, that she is adopted. The glowing line in Fantastic Mr. Fox, is just another way of setting the tone as both funny, lively, and even a little dark. We leave our characters stuck in a cage with farmers toting shotguns on their way outside, as Mrs. Fox tells her husband that she’s pregnant. The scene ends on a line about how if they get out of this then Fox needs to get another job, (besides bring a thief.) Then we cut to about ten years later and he’s working as a newspaper man with his own column in the paper they nobody reads. Fox and his wife have a child, Ash, voiced by Jason Schwartzman, and they live in a hole underground. And Fox is interested in finding a new home. Maybe something in a tree. He hears the views are much better above ground. This is the first of those “adult” conversations that characters have, discussing real estate, and it’s pretty great. The real estate conversation continues on with a lawyer, (Badger, voiced by long time Wes Anderson alumn Bill Murray.) They discuss things like different kinds of trees and location. And then when Fox buys the house in the tree, we watch developers and construction workers come in and remodel the house. All of this shows animals acting like adult, and the content couldn’t be more perfectly Wes Anderson. From Rushmore to Moonrise Kingdom, Anderson has practically crafted his own type of genre here and it’s remarkable to see how well it translates to animals in an animated version. The family drama that can be found in loads of Anderson movies is here too. Fox has conflicts with his wife. His son has conflicts with his relationship to his father, and also Ash has problems with his talented cousin, Kristoferson, who comes to live with them. Krisoferson is a natural talent at just about everything, including diving and karate, and he can’t help but demonstrate that over and over again. And all of this makes Ash insanely jealous. But while the boys are working on that conflict they have with each other, Fox is up to his old schemes again. He enlists the help of an Opossum friend, and together they begin robbing the three nearby farms, one at a time. Anderson is no stranger to heist and robbery movies, with his first film, Bottle Rocket, being about just that. And he is tapped the right actor to portray this criminal mastermind, with George Clooney. Who else could have headlined all three Oceans movies, making a remake film into a new trilogy packed to the brim with an all-star cast? Clooney is so charming that he is just right for this role, which includes a whistle he does whenever thing goes his way. The movie is about doing the three heists, reveling in the spoils, and then taking on the farmers who come after Fox and his friends for revenges. And all the while, Fox is telling his group of followers how great he is because they won. They beat the farmers. Little does he know there is more to come. Much more. This film does lose some of its edge in the final acts. Suddenly it becomes about the action more than it does about the humor. Even still, it’s a hell of a good movie, filled with some pretty remarkable voice talent. This is the kind of smart filmmaking that all animated films should feature.